Bruce Wayne is the son of Thomas and Martha Wayne. Two of Gotham's most well known citizens. Thomas was a doctor and Martha took part in many programs to help the lesser fortunate. One fateful night, Bruce went with his parents to see the movie "Mark of Zorro" after wards they were confronted by a mugger who shot and killed Thomas and Martha. This event left Bruce shattered and lost. At his parents funeral, Bruce vowed to avenge their deaths. When he was 14, Bruce left Gotham to learn the ways of the world. He took classes in some of the world's best universities and colleges and from teachers who didn't have schools or classes. He sought out the best detective's to learn how to do their line of work. After that, he learned and mastered every single martial art known to humanity. When he finally came home, Bruce joined the FBI but quit feeling that it wasn't his type of work. He became a vigilante but this was very dangerous as he came home with life threatening injuries at times. Bruce realised that he needed a way to intimidate his opponents. The idea to become Batman would come to him when a bat came crashing through his study window. Since then Batman has waged a ongoing war against crime. However he has vowed never to take a life or to use a gun. A tool that Bruce feels is responsible for his parents deaths. -Though Bob Kane is recognised as the creator of Batman. Many believe that Bill Finger is and should be recognised as co creator. Kane took his original design, which consisted of a red body suit, domino eye mask and wings attached to the arms, to Finger who made the changes that we see today. Kane over the years has been criticised by fans and creators for taking credit for his peers work and not giving them credit. However in later years Kane acknowledged Finger's work and regretted not making him a co creator. -Batman's costume has had several alterations. The first was in 1964 when Julius Schwartz took over as editor. He added the yellow background to the chest emblem. The next significant change came in 1994 when Batman got a new suit due to Jean Paul Valley taking over for Bruce. In 1995, the suit became all black but was later altered to with dark blue boots, gloves cape and cowl with a dark gray body suit with no underwear. 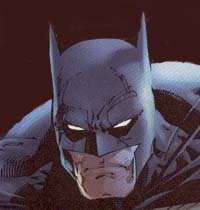 In 2000, the suit reverted back to Bob Kane and Bill Finger's original design.